When the fall weather hits, I start getting the baking itch. The temperatures have cooled somewhat and using the stove or oven no longer makes the house sweltering hot. A walk through the grocery store shows all the seasonal produce like squash, pumpkins, apples and add to that all the season baking products. Pumpkin spice this and pumpkin flavored that. It makes me think about the holidays and all the baking that comes with Thanksgiving and Christmas. Since pumpkin is so seasonal, I like to pick up extra pumpkins pie pumpkins and freeze the puree so I have some during the off seasons. I’ll also pick up extra canned pumpkin and other pumpkin flavored items to have on hand for later on. Buying in the seasons always helps on the budget. 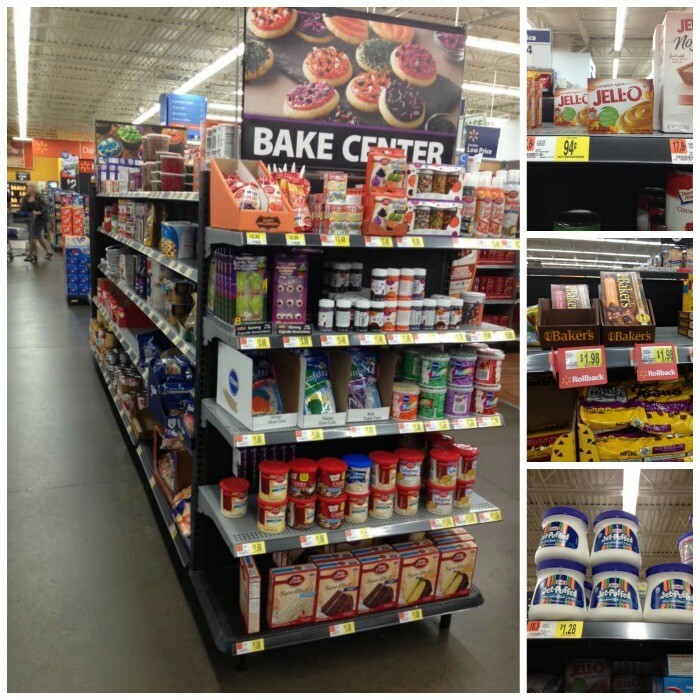 I’ve noticed the last couple years that when you walk into Walmart, they have this little Bake Center in one of the main grocery aisles. I find it handy to browse instead of going to the baking aisle because it’s not so overwhelming and items are still remaining budget friendly. We’re entering the baking season after all and now is the time you’ll start seeing some prices drop a bit on certain things. 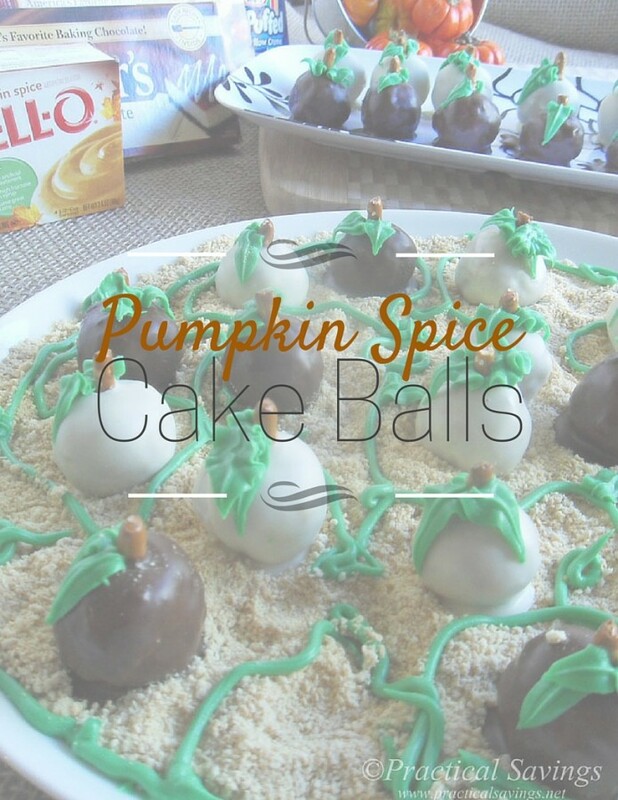 You combine the Bake Center products, baking and pumpkin and you get one very excited me. 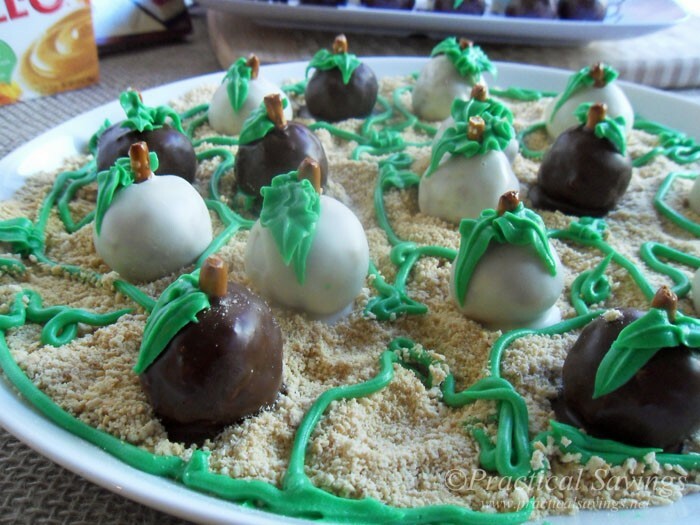 So today, let’s take a few items from those Bake Center shelves (namely Jet-Puffed Marshmallow Creme, Baker’s Chocolate and Jell-o Pumpkin Spice Pudding) and combine my two favorites…. 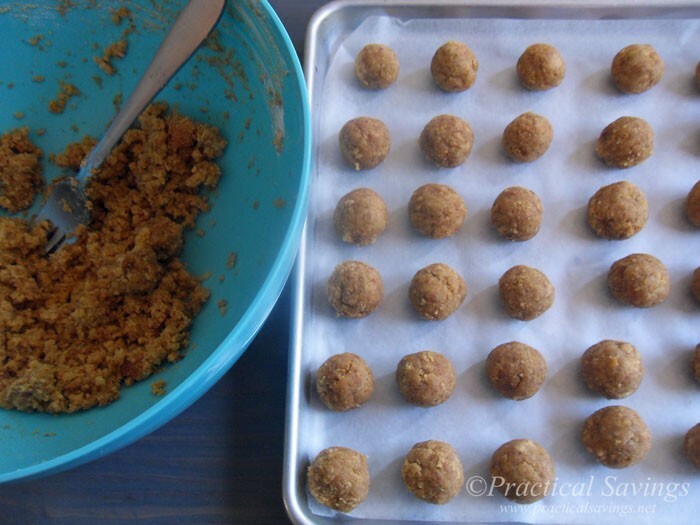 baking + pumpkin = some pumpkin spice cake balls. 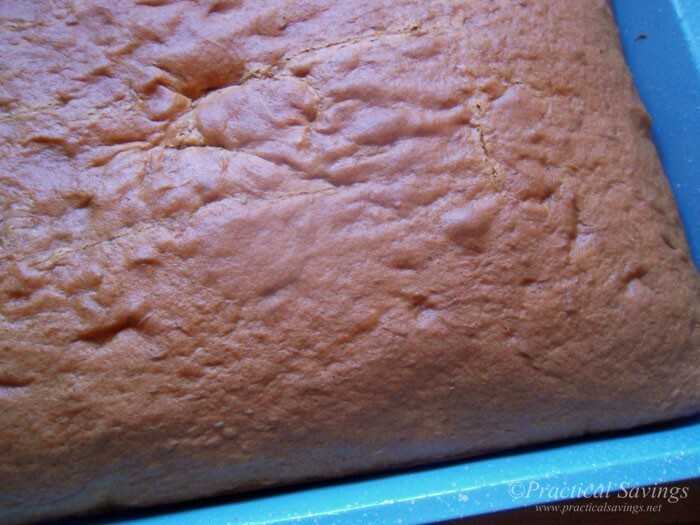 You’ll need a plain old yellow cake mix (not old as in age but you get what I mean, right? ), the recommended ingredients plus you’ll need an extra egg, extra water, a Jell-o Pumpkin Spice instant pudding mix (the 3.4oz size) and a bit extra pumpkin pie spice. Mix it up well, pour into a greased pan and bake for the recommended time. You might have to go a little longer since you’ve added a few extra ingredients, but just check it. Let your cake cool and slice it up into pieces (like serving size). Crumble the pieces into a large bowl and add a jar of Jet-Puffed Marshmallow Creme. Stir it up until combined. I do the combining with a spoon or fork, I would not use an electric mixer. 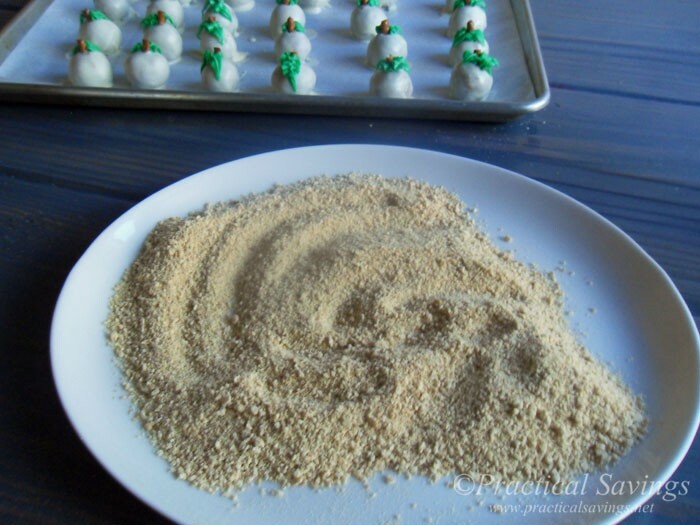 Gather your mixture in about one tablespoon amounts and start forming a ball. Rolling the ball smooth between your hands. Once you have them all rolled, stick them in the fridge or freezer until firm. While they’re firming up, start melting your Baker’s Semi-Sweet or Baker’s White Chocolate in a double broiler or microwave. Firming up the balls makes them much easier to dip. They’ll not only hold their shape better, but they’ll hold up better while you’re dipping them. If your balls are really frozen (like you’ve left them in the freezer for hours), you do take the chance of the chocolate cracking as they dry. If you want to avoid cracking, pull them out and let them sit for a little while. While the chocolate is soft, push your broken pretzel ends into the ball after you’ve dipped. Don’t wait to do a whole row or you might crack your chocolate. You can see my semi-sweet chocolate was much thinner than my white chocolate. I had added too much shortening to thin it. Once the chocolate has hardened (plop it into the fridge for a few minutes if it’s taking too long), you can add your leaves. I normally like to make my own frosting but didn’t have the time this week. 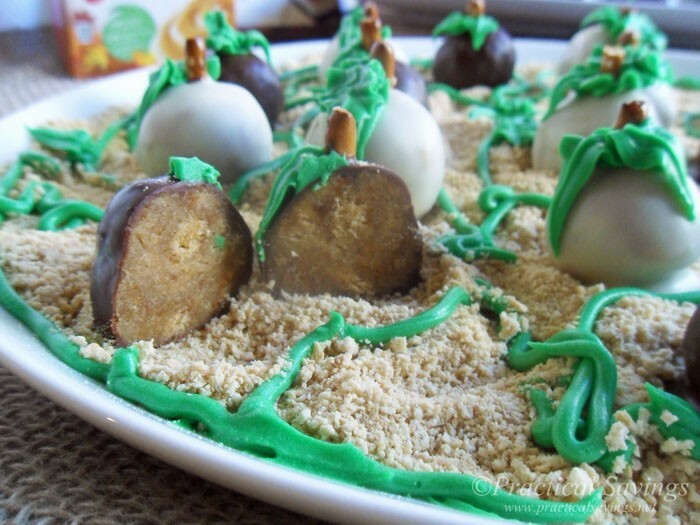 Using graham cracker crumbs, leftover frosting and a platter, I decided to make a little “pumpkin patch”. Pumpkin spice yumminess. Grease 9x13 pan and preheat oven for recommended temp for cake mix. 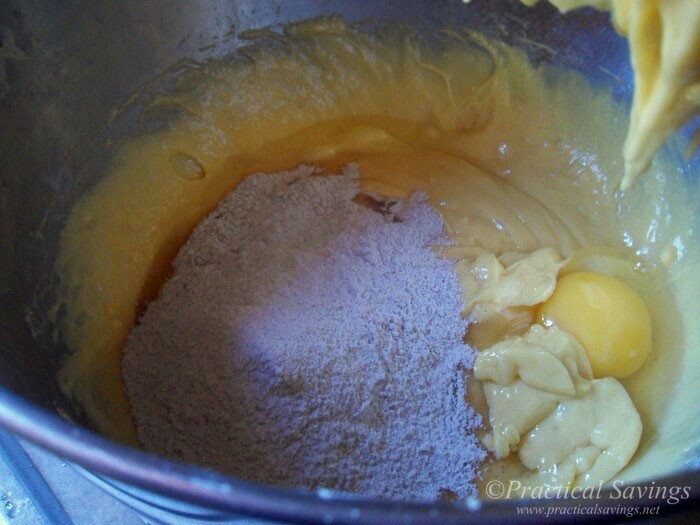 Follow box instructions for mixing the cake, plus add the egg, water, pumpkin spice and pudding mix. Pour into pan and bake for recommended time plus additional time needed. Tooth pick or knife should come out clean when inserted into center of cake. Let cake cool and cut into slices. 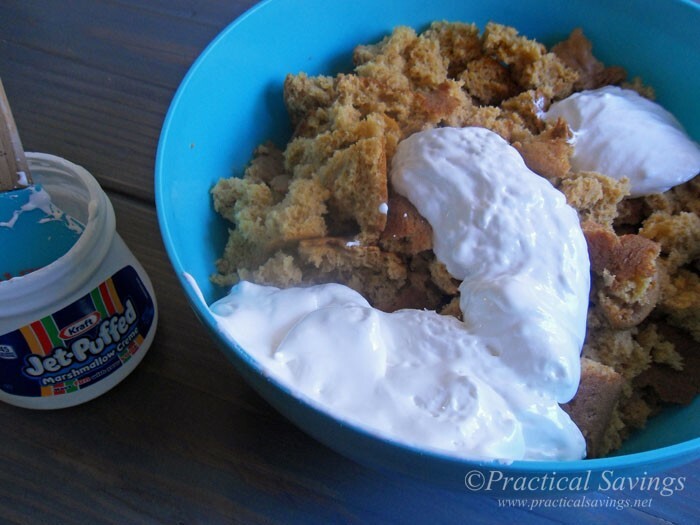 Crumble cake into large bowl and mix in marshmallow creme or frosting. Stir until combine. 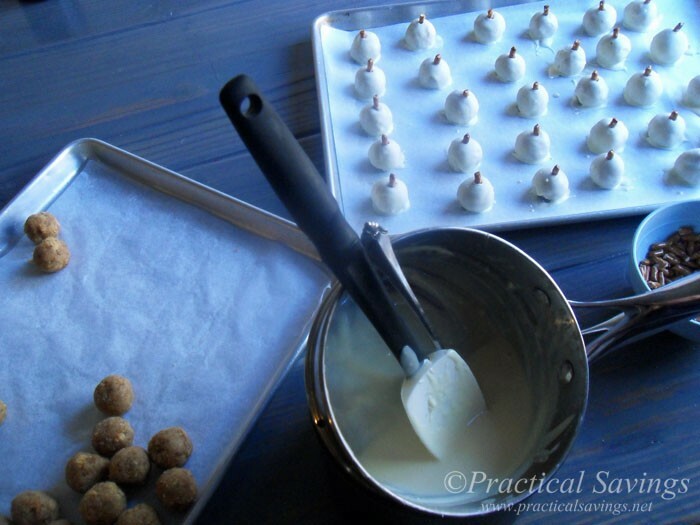 Using about a tablespoon amount, form into balls. 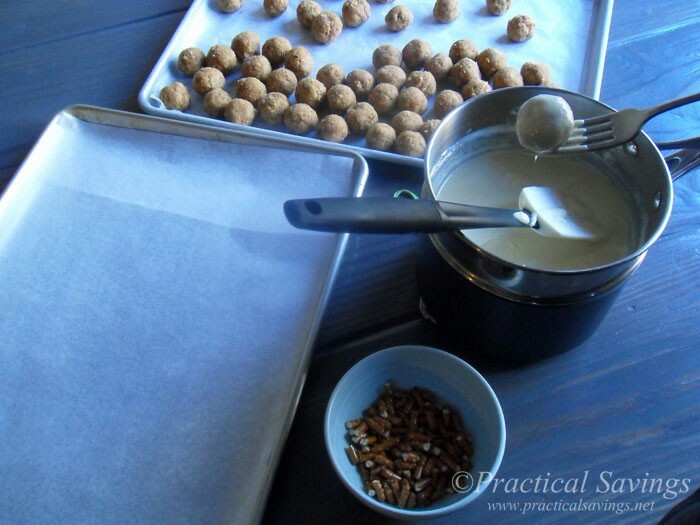 Place on a large baking sheet lined with wax paper. Chill balls until firm but not frozen. 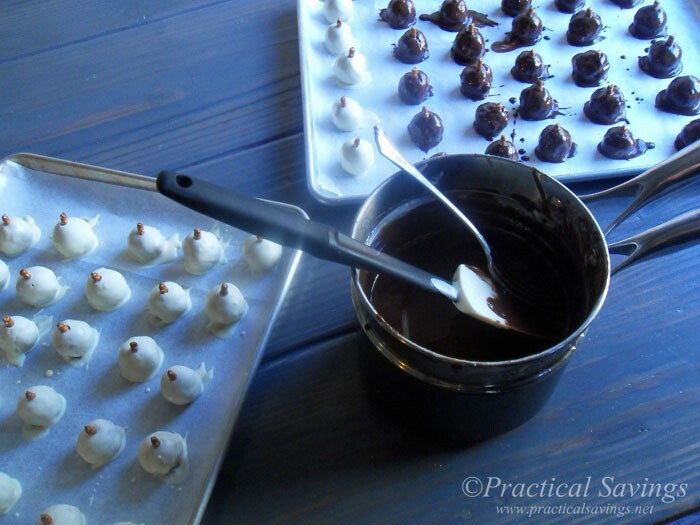 While balls are chilling, melt your chocolate bars in a double boiler or microwave. 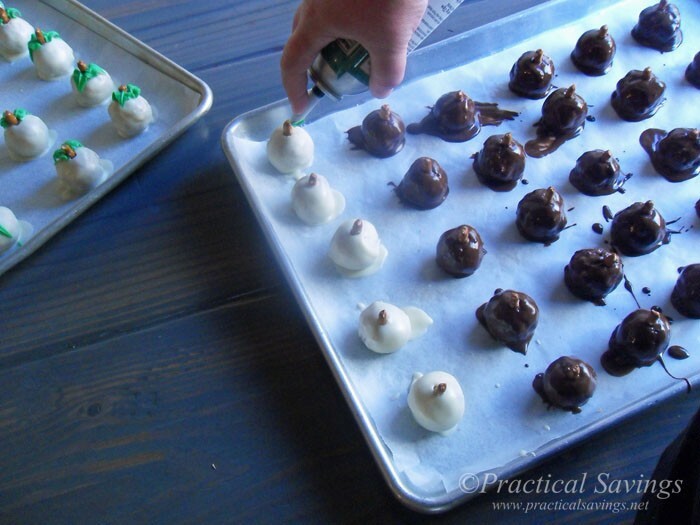 Remove balls from fridge and dip into chocolate. 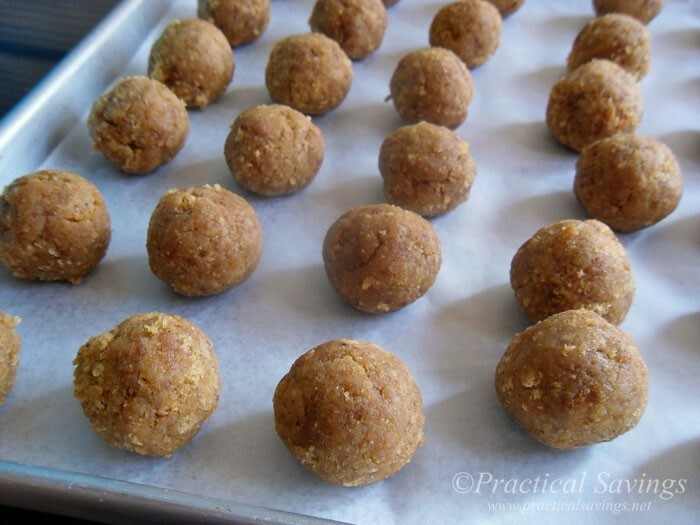 Place balls back on wax paper and insert pretzel stem. 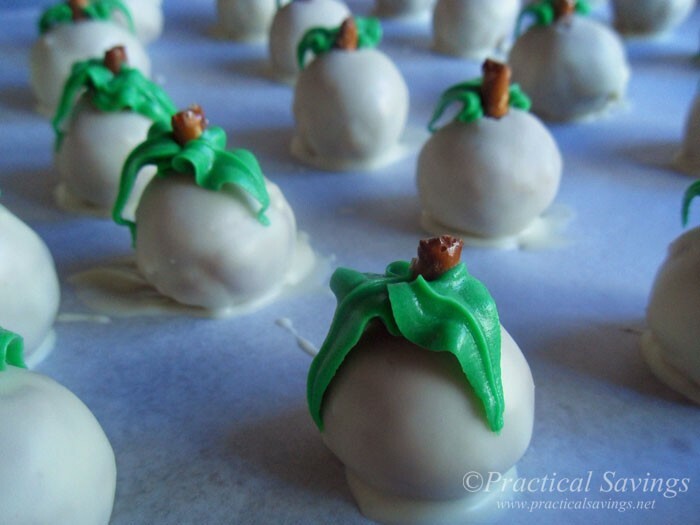 Let balls harden before adding frosting leaves. Chill balls until ready to serve. What are some of your favorite fall flavors or seasonal products? Adults do too. :-) Everyone at church loved how moist they were.